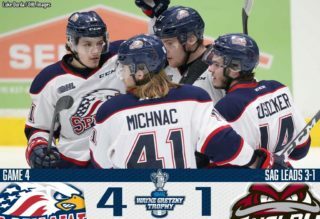 A total of 13 players have reached the Ontario Hockey League through two years of OHL Under-18 Priority Selection picks, and the Owen Sound Attack featured a pair of them this past season. Last year’s first round (15th overall) selection Griffin Wilson and offseason addition Kaleb Pearson who was originally Flint’s second round (29th overall) pick in 2017 both made the jump together. Wilson, of Elora, Ont. and Pearson out of St. Mary’s, Ont. both suited up for the Huron-Perth Lakers Midget AAA program as well as the Stratford Warriors Jr. B club prior to joining the Attack. 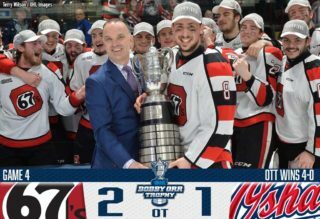 For Owen Sound GM Dale DeGray, the Under-18 Priority Selection presents another opportunity to find that complimentary piece that could round-out a penalty killing unit or provide an added layer of depth in the lineup. “A lot of the kids you’re going to find here are the late bloomers, the guys who need a bit of extra time to grow and refine their skills,” he said ahead of Wednesday’s proceedings that can be heard live at ontariohockeyleague.com. 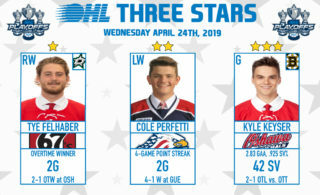 Pearson, who put up 67 points (39-28–67) and was named GOJHL Midwestern Rookie of the Year in the season that followed being chosen by Flint, joined the Attack this past season and put up 28 points (14-14–28) over 66 games as an 18-year-old. Pearson and Wilson each share a Stratford connection, something they have in common with Attack all-time great and former OHL champion Joey Hishon who wore the bear on his chest from 2007-11 and now serves as the club’s assistant coach and assistant general manager. Wilson put up 13 points (4-9–13) in his first OHL season, scoring his first OHL goal on Oct. 26th in Mississauga. The 6-foot-3, 209Ib centre will look to carve out a bigger role for himself come September. The Attack will select ninth overall on Wednesday, giving DeGray and his staff a chance to bring in a young player who will have a shot at cracking the lineup in the fall. 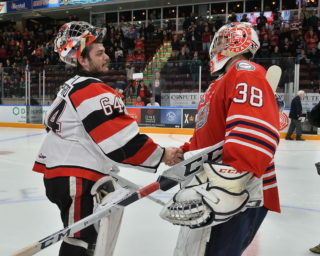 Jobs are there for the taking after Owen Sound moved out veterans Nick Suzuki, Kevin Hancock, Sean Durzi and Markus Phillips this past season. “Anybody that looks at our group and has an idea of what took place over the past winter would look at that and say ‘hey, maybe that’s the destination for me,'” said DeGray. “You always want to leave camp with the best 22 or 23 players that you can possibly start with, and if some of those are U18 picks or free agent invites, fantastic.